Normally the books I get pitches for are new and about to come out. Today I present you with a book that is now ten years old, but is better than most memoirs at your local big box bookstore. 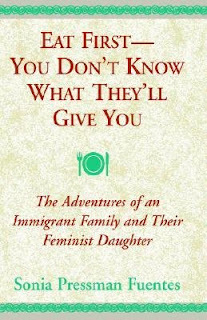 Eat First - You Don't Know What They'll Give You: The Adventures of an Immigrant Family & Their Feminist Daughter by Sonia Pressman Fuentes is actually more of a family memoir than a personal memoir. 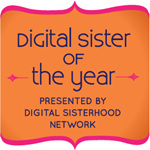 Most notably, Sonia is one the founders of the National Organization for Women (NOW). As a small child, she fled Nazi Germany with her parents and older brother and settled in New York. We not only learn the trials of growing up in a new culture, but also the back story of her parents' marriage, which may explain why Sonia has such a hard time with her own relationships. When I meet "famous" people, I try to remember that they are just human beings like me. They just did extraordinary things or perhaps just in the right place at the right time. While I may fawn over someone like Sonia, it's comforting to know her human side. But she certainly did some extraordinary things! That said, the memoir jumps around time. One page you are reading about someone's death and the next chapter opens with a story about that person. There are a lot of very short stories, more like anecdotes about various people in her life. So while I felt the structure was not of the usual memoir, it read nicely. It does start off a bit slow with her parents' background, but once I realized how central they are to her life and thus the entire memoir it was an easier read for me. I can be quite an impatient reader. This book is part women's history, part Jewish history, part memoir and part a study in family relationships. It's a must read for those interested in the origins of the largest feminist group in the USA as well as a simple story of a little Jewish girl who moves to the USA and grows up to be quite the giant slayer. You can get a copy for yourself at an indie bookstore or Powells.com. Disclosure: Sonia wrote to me and asked me to read her book for review. In exchange I have a new view of NOW and an autographed copy of her memoir.